1. Comeback time: U.S. stock futures were definitively higher and most European markets were rising by more than 1% in early trading. Investors are clearly feeling steadier after panic flooded the markets over the previous few days. The Nasdaq briefly hit correction territory on Thursday, signaling a 10% decline from a recent peak. Even though markets had a wild ride on Thursday, stocks settled down at the end of the day and the indexes closed with only minor changes. 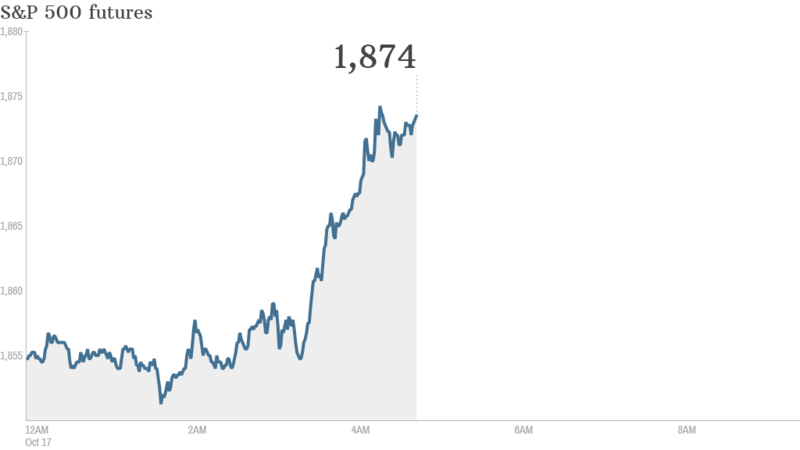 The Dow lost 25 points, while the S&P 500 and Nasdaq edged into positive territory. CNNMoney's Fear & Greed index still shows investors are feeling extremely fearful. Over in Asia, the main stock markets were mixed at the close of the week. 2. Earnings and economics: Investors are waiting for General Electric (GE), Morgan Stanley (MS) and Honeywell (HON) to report quarterly earnings before the opening bell. The U.S. government will post housing start data for September at 8:30 a.m. ET. The University of Michigan Consumer Sentiment Index comes out at 9:55 a.m.
3. Stock market movers -- Google, Urban Outfitters, Rolls Royce: Shares in Google (GOOGL) are slipping premarket after the company's quarterly results showed third-quarter sales came in short of expectations. It also reported another decline in the average amount paid by advertisers when a user clicks on an ad. Shares in Urban Outfitters (URBN) are plunging by 13% premarket after the retailer warned that third quarter earnings will be squeezed. Rolls-Royce (RYCEY) is having a tough day on the London markets. Shares in the aircraft engine-maker are falling by about 8% after the firm warned that market conditions have deteriorated and some big customers are delaying and canceling orders because of Russian trade sanctions. 4. Shoes and shares: Shoemaker Jimmy Choo debuted on the London stock market Friday. Shares were relatively flat in early trading. The company picked the ticker symbol "CHOO".